Bear Saves Drowning Crow: A Moral Act? On Monday my inbox overflowed with people sending me a link to a video of a bear saving a drowning crow at the Budapest Zoo. 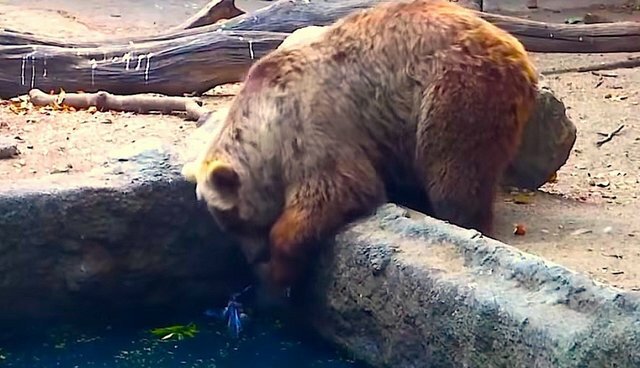 Watch as the bear gently plucks the crow out of the water, places it down, and resumes eating. It's impossible to know what the bear was thinking and feeling but clearly he saved the crow from drowning. This rescue reminded me of a female bonobo named Kuni who rescued a stunned starling at the Twycross zoo, (Mark Rowlands' account of which can be read in full here). One day, Kuni encountered a starling that had been stunned during some misadventure. Fearing that she might injure the bird, Kuni's keeper urged her to let it go. Kuni, however, picked up the starling with one hand, and climbed to the top of the highest tree in her enclosure, wrapping her legs around the trunk so that she had both hands free to hold the bird. She then carefully unfolded its wings and spread them wide open. She threw the bird as hard as she could towards the barrier of the enclosure. Unfortunately, it didn't wake up, and landed on the bank of the enclosure's moat. While her rescue attempt didn't succeed, Kuni certainly seemed to act with good intentions, and tried to make amends by guarding the vulnerable, unconscious bird from a curious juvenile for quite some time. And, then there's the well-known story of Binti Jua, a female western lowland gorilla, who saved a boy's life at the Brookfield Zoo. In our book Wild Justice: The Moral Lives of Animals Jessica Pierce and I argue that these and other similar cases lay the foundation for claiming that other animals have a moral sense as does Mark Rowlands in his book called Can Animals Be Moral? Renowned primatologist Frans de Waal concurs as does Charles Darwin. As Professor de Waal reminds us, nature offers many lessons for a kinder society. Let's keep the door open on the moral lives of nonhuman animals. Surely we're not the only occupants of the moral arena. As Mark Rowlands notes, echoing Jessica Pierce and my major message, "Our morality is rooted in our biology rather than our intellect."